Q: Why can't the negative values be considered as possible answers to the last practice problem? A: The key here is that x can be negative, and the expression inside the absolute value can be negative, but the absolute value itself can never be negative. Let's take a look at how this plays out in the two equations you mentioned! l2x + 5l = -3 or l2x + 5l = -1 ---> but an absolute value can never be negative! Q: What's an extraneous solution and when do we need to check for them? A: Extraneous solutions are invalid and do not solve the original equation. On the GRE, you must check your answers on algebra problems involving squaring or taking roots. Extraneous roots are not considered solutions on the GRE. Squaring both sides of an equation with radicals makes it possible to introduce extraneous roots as solutions. It is essential to check the answers you find to figure out if they are extraneous. To check if any of your roots are extraneous, plug each of the roots back in to the original equation. If the root does not solve the original problem, then it is extraneous and is not a one of the solutions. 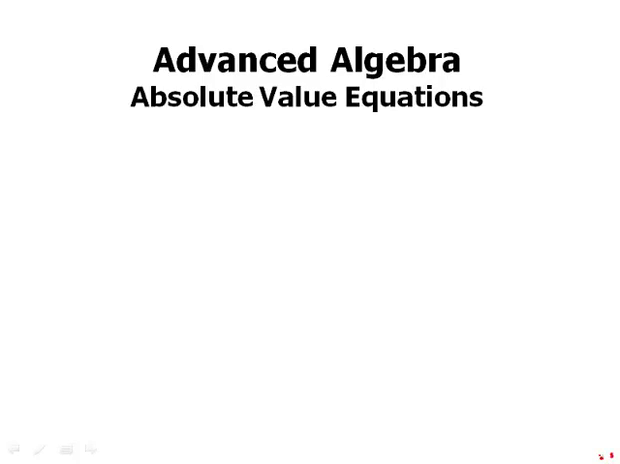 Now we'll begin a section on Advanced Algebra, kind of a grab bag of advanced topics in algebra. First thing we'll talk about are Absolute Value Equations. Recall what we said about absolute value in the lesson Positive and Negative Numbers-II in the Arithmetic and Fraction module. If you haven't seen that module yet, then you haven't seen that lesson, I'd suggest looking at that first and getting a good sense about absolute value before we go through all the information in this lesson. So, we'll begin with a simple observation like for example. Absolute value of positive 5, of course, it's positive 5, absolute value of negative 5 ir of course positive 5. So, either these equations absolute value of 5 equals x or absolute value of negative 5 equals x would have the single solution x equals 5. Those are not very interesting equations, it's not very interesting when there are no variables inside the absolute value. So, this is another category of algebra equations that can have two solutions. Suppose an expression other than x is inside the absolute value. So for example, the absolute value of the quantity 2x plus 3. And all that's gonna equal 5. Well of course, if that whole expression has an absolute value of 5, then there's only two possibilities for it. Either, the expression inside equals 5, or equals negative 5. So it's very much the same approach. We're gonna set that expression equal to 5 and set it equal to negative 5 and of course it's connected by the word or. And remember, exactly the same way with quadratics, this word or is a mathematical object, it's not a piece of garnish, it's a necessary part of the problem. I should hasten to add here this notation I'm using E for an expression I just made this up on this page. This is not a general, a general notation that you're gonna see anywhere else. I'm just using it for shorthand here. The idea is that we could put any expression inside the absolute values and then whatever it equals, whatever that absolute value equals, the expression itself would equal to positive or negative of that same value. Notice, if the absolute value is not by itself on one side, you will have to isolate it before we can break it into the two or equations. Here's a practice problem. Pause the video and then we'll talk about this. So of course with this, we have to isolate the absolute value first. We subtract 1. Once we subtract 1 then we're all set. Gonna break it into two equations. Solve each equation individually, divide by 3. And we get x equals positive two thirds or x equals negative 2. And those are the two solutions. What if the absolute value of an expression equals not in single number, but in another expression? So now we're actually getting into the territory that the tests would actually ask us. We'll still follow the same plan, so absolute value of anything equals something else. It means that thing inside the absolute value A equals either positive B or negative B. So equals either the expression on the other side or the expression on the other side with a negative sign in front of it. Sometimes this will give us extraneous solutions. Solutions that result correctly from the math, but which don't work in the original equation. We have to check each solution. So this is an odd thing about absolute value equations. And we'll see this again much later on when we talk about square roots also that we get extraneous solutions. So that means we have to check our work, check the answers that we find. So here's a practice question. Pause the video work on this and then we'll talk about this. Okay for this one the absolute value is already isolated so we can immediately break this into the or equation. So we say that the thing inside the absolute value 1 plus 2x either equals that expression 4 minus x or equals the expression with a negative sign in front of it. And of course, putting a negative sign in front of subtraction just reverses the orders, of the subtraction it becomes x minus 4. So, first thing we're gonna do is we're going to get all the x's on one side in each equation. Then subtract the 1 and isolate the x and then divide. And we get the solutions x equals 1 and x equals negative 5. Now we're not done here. We did the correct math, so these two solutions correctly result from the math. But we don't know, do they actually satisfy the original equation. So we have to check. So for x equals 1, I plug it into the left side, I get 3, I plug it into the right side, I get 3. Here's a practice question. Pause the video, work on this, and then we'll talk about this. Okay, again, the absolute value is isolated. So we can go directly to the or equation. So the thing inside x plus 4 that's either gonna equal the expression or equal the expression multiplied by a negative sign. So the first thing we're gonna do is get all the x's on one side. Then we're gonna subtract to isolate the x and we get either x equals 1, or x equals negative 1.5, or negative three halves. So now we'll plug these in and check these. There, those are our two solutions. For positive 1, when we plug that into the left side, we get 5. When we plug in to the right side we get 5. That checks, that's perfectly fine. Negative 1.5, when we plug this in to the left side, we get 2.5. When we plug it in to the right side, we get negative 2.5. So this doesn't work. It gives a different value on the right and left side when we plug in. So this doesn't work, and this, this equation has only one solution, x equals 1. Here's another practice question. Pause the video and then we'll talk about this. So we can go directly to the or equation, the thing inside, 2x plus 5 either equals x plus 1 or equals x plus 1 multiplied by a negative sign. We'll group the x's on one side, we'll subtract the 5. And we have to divide by 3 in the second equation. So we get, x equals negative 4, or x equals negative 2. So these are our roots. So, we have to check these roots now. Check the first one, x equals negative 4. When we plug into x plus 1, we get negative 3. That's a negative number. So we don't even have to plug-in, to the absolute value, because we know that the absolute value can't have an output that's negative. So this answer doesn't work. Now we'll check negative 2. When we plug that into the right side, we also get a negative number. So that, also, doesn't work for the same reason. We can't have the output of the absolute value equalling a negative number. So both of these answers resulted from correct math we followed all the steps of the math correctly. But both of these are extraneous roots. The algebra leads us to think that they might be solutions, but it turns out that they actually don't work when we plug them into the original equation.